Work began on the first version of the map on Saturday, ‎29 ‎September ‎2012 ‏‎at 10:24:47 AM, however we had been planning MCAlagaesia since before then. Why can't I join the MMO server? The MMO server is currently whitelisted for the build stage of the server. 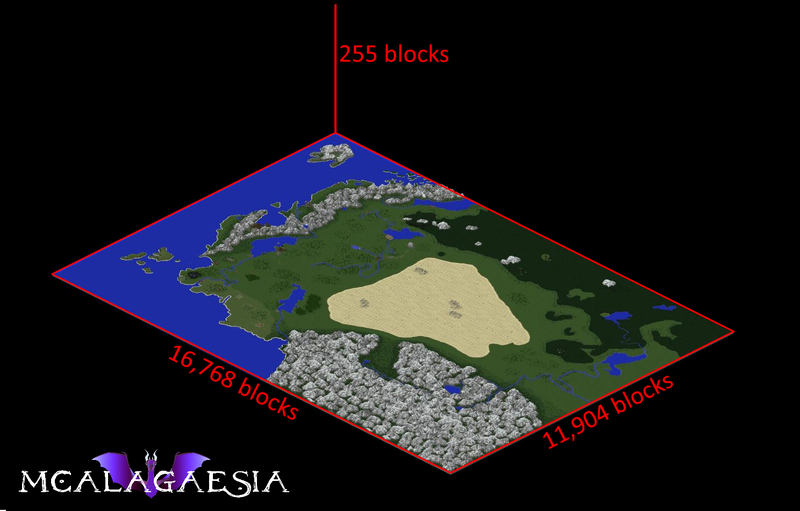 You can still join the Public Build Server and the Survival Server at "play.mcalagaesia.com"! Can I help build MCAlagaesia? Of course! Join at "play.mcalagaesia.com" and get building for your chance to be accepted as a builder! If you want to become a builder, you have to show us your skills by building a medieval human, dwarven or elven themed plot and then submit it on the forums. If we love what you build, we'll offer you a position on the team! At the moment, you can apply to become a terraformer or a builder. To find out how, see "Can I help build MCAlagaesia?" above. Moderators are hand-picked by the executive staff from the community. What does it take to become a moderator? Will I need mods to play MCAlagaesia? All additions are added with plugins, meaning you don't need a mod or modpack to join in the fun. Big thanks to developers HyperElectron, Azza007 and Hellomynameis99! Check out this video for a visualisation. Why isn't MCAlagaesia 1:1 scale? 1:1 scale is impossible due to the height limit of Minecraft. Many people assume it would be easy to make the map the same size as it was in the books. However, they don't think about scaling in the Y direction. They forget that the map is a cuboid with a height, not just a plane that can be stretched out endlessly without consequence. So we weren't being lazy, we're just at the limit of how far we can scale the map while keeping things somewhat realistic in height..